Huzoor-e-‘Aali Saiyedna Haatim Zakiyuddin saheb (tus) did Karam on the Mumineen of Fatehgunj area when he accepted the ‘Izn and did Majlis-e-‘Ilm-o-Hikmat in the residence of Zulfiqaarbhai S Surti on 28th Safar 1438 AH/28 November 2016 AD, Monday on the occasion of Shab-e-‘Urs of Maulaana Imaam Hasan (as). 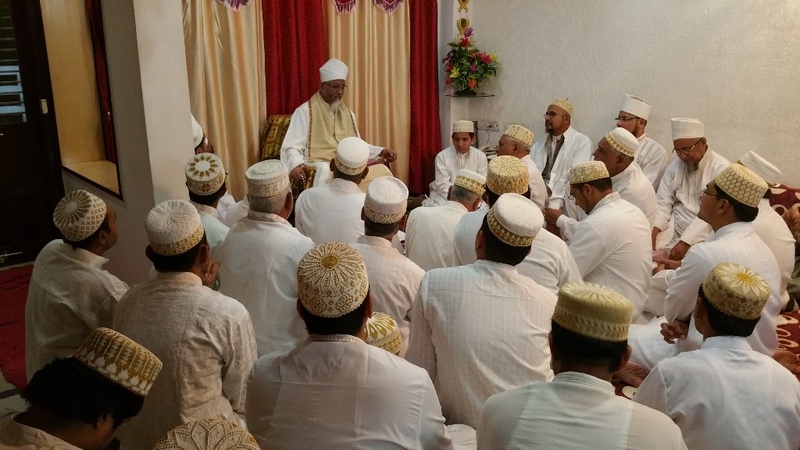 Along with Hudood-e-Da’wat, mumineen-muminaat of every house-hold residing in this area attended the much awaited majlis to listen to the Nooraani Kalemaat of Aqaa Maulaa. During the time of Muqaddas Maulaa, the tadbeer to start the Imaamat Namaaz in Fatehgunj was done but that never got a shape. “Wa le-kulle Ajalin Kitaabun”, Every period-time is prescribed for the things assigned by the Hikmat of Allaah Ta’aala. It is not in our hands to delay or propound anything against the Will of Haqq Ta’aala. If in case our efforts doesn’t bear any fruits then leave it to Him, He knows what is good or bad for us and it will definitely happen on time when He wishes. All of the above are interconnected and correlated. If anyone who don’t believe in these Deeni Usool and Articles of Faith, then he ceases to be an ‘Alavi Mumin. A mumin’s life is divided into Childhood, Adulthood, Parenthood and Sainthood. He must see that his Childrens’ Childhood is modeled with Madrasah. His Adult Family members are aligned with the centrality of Misaaq and by abiding to its core principles. This leads to their participation in each and every ‘Ibaadaat and gathering in Masjid. Parenthood responsibilities have its roots in Majma’ (social assembly) and Maa’edah (thaal of Tashakkur) where Deeni Aadaab is dispensed and adhered with. Mazaar is an important aspect of Sainthood-to be ‘Abd and Parhaizgaar.